Wolfgang Amadeus Mozart made Salzburg one of the most popular tourist venues in the Austria. Salzburg is rich in tradition, history and culture; the carefully preserved Baroque architecture and the beautiful scenery create a unique charm. The musical ‘The Sound of Music’ (the story of the singing family Trapp) brought Salzburg into the homes and hearts of the American people. The river Salzach divides the city into two parts: the romantic ‘Old Town’ with its small alleys and narrow houses underneath the Mönchsberg and the ‘New Town’. Tourists vacationing in Salzburg will find a selection of first class hotels and restaurants meeting the highest international standards. If you have a sweet tooth, do not miss to stop at Brodgasse No 13, the parent house of the world famous ‘Mozartkugeln’. Salzburg offers many picturesque sights. Take your camera and explore Salzburg on foot. The narrow houses, tightly nestled together, give Salzburg a certain architectural flair. The courtyards are very special: vaulted passageways, balustrades, reliefs and moulded cornices create a unique atmosphere. 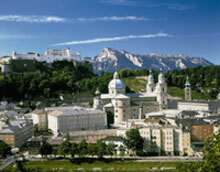 Take the funicular railway and reach the Hohensalzburg Fortress in 2 minutes– or take a 20 min. walk. You will be awarded with a magnificent view of Salzburg. The fortress was built in 1077 by Archbishop Gebhard at the south east peak of the Mönchsberg and is Salzburg’s landmark. The enormous fortress with its medieval and baroque constructions is one of Europe’s best preserved medieval fortresses and successfully guarded over the city for more than 900 years. Tour through the numerous chambers on your own. For friends of culture and antiques, the visit of the Residence is a must. Magnificent mural paintings, ceiling frescos and beautiful ovens can be admired. Take a guided tour through the splendour rooms. The glamorous audience hall shows Flemish tapestries (around 1600) with scenes of the roman history as well as valuable furniture of Paris. In the emperor hall are portraits of the Roman-German emperors and kings of Habsburg ancestry (1273-1740). The first early baroque edifice north of the Alps was built 1614-1628 by Italian Santino Solari. It was destroyed by fire more than once, rebuilt and expanded. The original church thus experienced at least three extensive building and rebuilding campaigns during the early Middle Ages. It is now one of the city’s most significant piece of church architecture. Around 700, a Frankish missionary named Saint Rupert founded St. Peter’s church and a monastery. It housed the Archbishops until 1110. Walk through the ancient buildings, which were mostly built in the 17th and 18th century and step back in time. The annual Salzburg Festivals invite an international clientele at the foot of the Mönchsberg from end of July until end of August. At this time of the year, the locals are outnumbered by a large margin; millions of visitors travel to the city. Three main stages within close proximity offer seats for the onlookers. The ‘Felsenreitschule’ (Rocky Riding School) is also worth a visit. It was built more than 300 years ago to train the Archbishop’s cavalry. Today it offers 1549 seats for theatre and operetta performances. Stroll through the ancient alley with its high, narrow houses, beautiful shops and wrought-iron guild signs. At house No 9 you find the portal of Mozart’s birthplace. From 1747-1773, family Mozart lived on the 3rd floor which houses now a museum. Take a look at Mozart’s childhood violin, his concert violin and musical scores. If you look for a souvenir, browse through the wide selection of shops. Salzburg’s ‘Old City’ is famed as being Austria’s most attractive shopping center. Salzburg is situated in the Western part of Austria, 300 km (187 miles) from Vienna and 150 km (93 miles) East of Munich, Germany. The airport is located 4 km (2.5 miles) from the German border and 4 km (2.5 miles) from the city center. There are regular bus transfers between the airport and Salzburg main railway station.